All of these pieces can be seen togther on our Vintage Office Tables page. 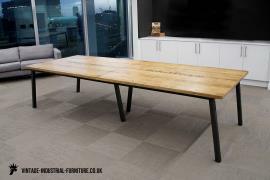 We also supply products to communal and shared office spaces - please see Vintage Industrial Furniture Tables at Brixham Seaworks. We also make items of storage which are applicable to vintage industrial office furniture - please take a look at our vintage industrial cupboards. Last but not least, don't forget that people will usually need to sit down at some point - take a look at our Old School Chairs which look great in a vintage industrial office furniture scheme.